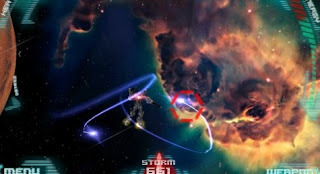 Android Game App Review - DROID COMBAT - MISSION ALPHA by MunkyFun. Quite a fun and addictive game, you get to fly a droid in various combat situations (mostly space but atmospheric combat also exists) against another drone. You and the enemy fire missiles at each other and you use lasers to detonate the enemy's mech missiles from reaching you and fire missiles of your own at the enemy. Now, the trick here is to time your strikes and your defenses. You can plot a course for the missile to prolong its flight time (and thus, create longer courses for the missiles you fire first, shorter and more direct courses to the missiles you fire after) and fire several missiles to overwhelm the enemy's droid or robot defenses. The game is fun, has great graphics, a sizable amount of upgrades and equipment and even a multiplayer mode. The space combat backgrounds are really breathtaking, as is the in mission graphics. But, as is almost always the case, there were things we didn't like. Droid Combat's missions become repetitive in time with little variation, even though you get to use different missiles and lasers. In addition, it costs money or a lot of time to be able to purchase the various upgrades. Last but not least is the fact you get a notification if you don't play for more than a day or so, which almost all of our testers found annoying. Notification bar is for smartphone notifications and not telling you you haven't played for over twenty four hours! In conclusion, a fun an addictive game that lasts for a month or two, tops. We can hardly wait for the next versions, with more missions and diverse scenarios! Score: 4.5 out of 5. Great graphics and an interesting general concept but a repetitive and restrictive game play. Description: A 3D mech combat game where you play against another mech in fligt, firing missiles and lasers to intercept the missiles. In time, you earn enough money to upgrade your weapons and even buy new mechs. Bad Points: Repetitive game play that becomes a little boring in time. A messege in the notification bar (!!!) if you don't play for more than twenty four hours. Experience: The game is quite large but installs with no problem. We encountered very few crashes and freeze-ups of the game. Multiplayer was a problem though because too few people play the game, yet. Longevity: Most of our testers enjoyed playing Droid Combat for a month or two and then uninstalled it (this is quite the normal time for Android games). A few die-hard mech combat fans kept the game installed.